The lanky defender has said that he was paying for Lionel Messi and Luis Suarez to go shopping in the wake of making waging with the strikers over free-kicks in Barca training sessions. The centre-back’s future remains an intriguing issue this summer, with growing speculation surrounding him with a move away from Camp Nou looking certainly that Premier League side Everton are in pole position to secure his services. While Manchester United and Lyon are also keeping tabs on him. It has been an intense campaign for the Colombian since his arrival at Camp Nou as far as minutes played is concerned, but it hasn’t been all fate and misery as the 23-year-old disclosed to Bocas magazine. “When I arrived, to create a good atmosphere I started to bet with Messi and Suarez to see who took the best free-kicks in training,” he said, “I did it just to watch them. “Before I knew it they were taking 50 euros a day off me. And I was like, ‘What, I’m paying for these guys to go shopping!’ But the truth is those monsters put the ball wherever they want it. 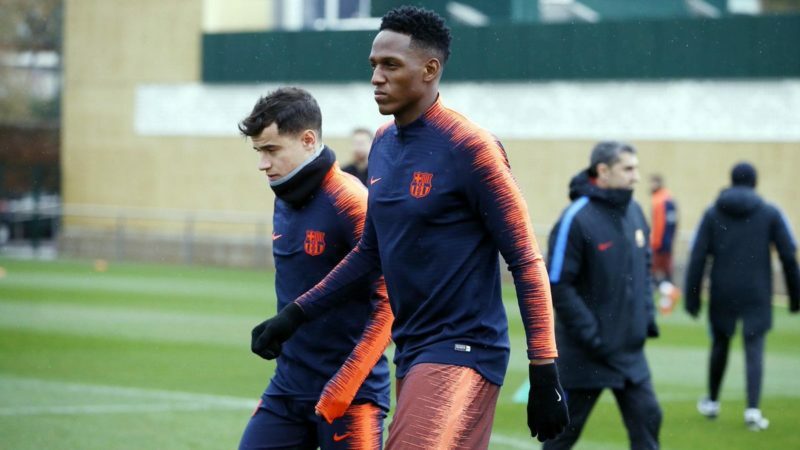 Jokes aside, Mina’s time in Catalunya has not been easy, with playing time difficult to come by and the Liga champions eager to move Mina on this term to make space for non-EU players. Even when he did play, though, Mina admits that nothing felt like it was going his way. “I thought a lot of things, a lot of bad things,” he went on. “I thought I was finished. “I felt so bad and [Philippe] Coutinho and Paulinho tried to encourage me all the time and told me that everything would be fine. “For me, I understand that there are spectacular players [at centre-back] but I just wanted to have a minute to impress and it didn’t happen. “The few minutes I did get, they were bad … it felt at times like everything was going wrong and coming down.